The eleventh doctor’s companion will be available as a Rock Candy collectible figure. This is a 2018 Fan Expo Limited Edition that will also be available through Barnes & Noble and Books-A-Million. Booboo, did you know about them? 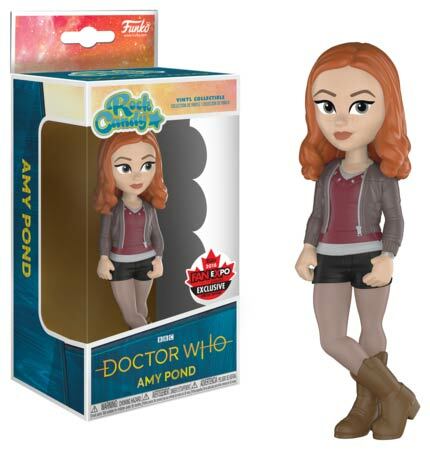 As much as I love Amy and Clara merch I feel like it’s time for maybe some Martha or Donna stuff.. they don’t have any pops, only recently got included in Titans, barely get any cool stuff like this etc….. Bit random, I mean I get that the BBC want to capitalise on Karen Gillan being a big hollywood actress now, but with a brand new series on the horizon, shouldn’t they be publisizing that, or even, if it must be a previous era, would it not be better to start with a previous doctor? First bit of merchandise from past eras to be put into the new packaging design. Glad it’s being used for everything rather than just the 13th Dr stuff. When is the Canadian Fan Expo? Hopefully this makes it to the UK market, I’m doubtful though.